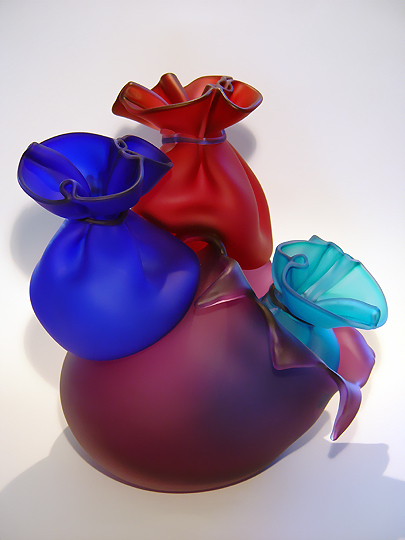 John Littleton and Kate Vogel are well known for their glass works that feature bags made of glass... sometimes the bags are simply stuck together, sometimes one large transparent bag contains one or more smaller bags. In this case, however, one of the bags is "exploding" and releasing a bag from captivity within itself. This work and others like it are created by fusing together multiple bags which have been blown and annealed separately. To create the exploding bag, John and Kate took a very large bag, reheated it, and then sliced open the top and peeled it back to create an opening that could contain a smaller bag, fused in place. This work is whimsical, but at the same time demonstrates a very high level of both skill and vision. The coloring in this work is great... I really love the combination of translucent amethyst, teal, red, and royal blue. I think the idea of freezing the exact moment in time when the large bag explodes is really cool... it's like seeing a snapshot of something you ordinarily would not be able to see, such as the bursting of a balloon.